It’s that time of the year again when couples, soon-to-be-couples, and those that prefer to go solo anticipate and look forward to – Valentine’s Day. Buddha-Bar Manila, the country’s top destination restaurant-lounge-bar, offers the most ideal Valentine’s venue for a complete romantic vibe that will make it a night to remember. Buddha-Bar Manila is every diner’s favourite as it adheres to the demands of every occasion. A reputable first-class restaurant, Buddha-Bar Manila possesses a soothing atmosphere with relaxing mixture of black, red and gold colors that adorn the whole place giving it an elegant appearance where tranquility and abundance powerfully resonate, with prettily crafted chandeliers and mahogany-framed sofas picture that warm tone embracing every dining couples, family, friends, or in-between. This Valentine’s Day, Buddha-Bar Manila will once again surprise the town with its signature promos and irresistible offers, with the 4 Course Valentine Dinner Specials, Buddha-Bar Manila makes sure it will be a date to forever. Diners are in for a treat as the 4 Course Dinner Specials prepared meticulously by internationally trained Buddha-Bar chefs are priced at Php 1800 net that perfectly goes with a free glass of wine, box of chocolate pralines for the ladies and especially wrapped gifts for the gentlemen. 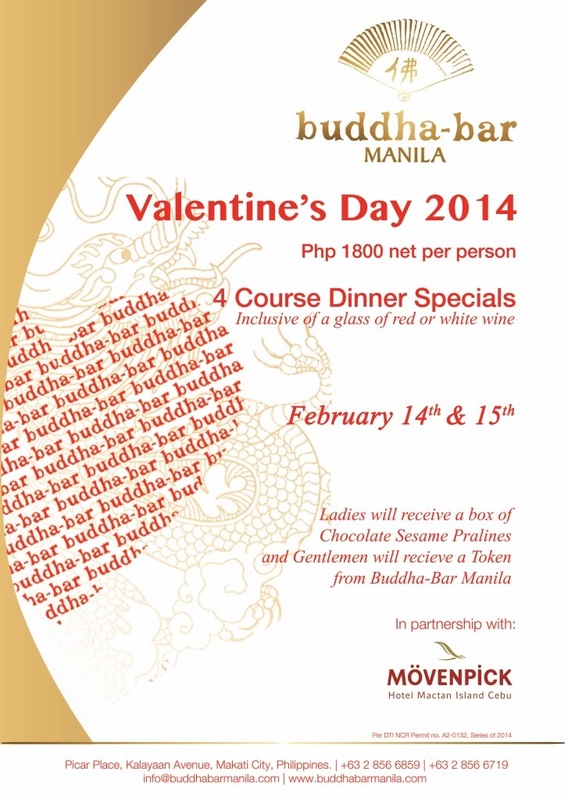 Buddha-Bar Manila’s Valentine’s Day special does not end with a fancy yet affordable dinner, guests who avail the 4 Course Valentine Dinner Specials which is available on February 14 to 15, could get a chance to win exciting prizes such as special Buddha-Bar gifts, bottles of wines, and a fabulous accommodation at Movenpick Hotel in Mactan Island, Cebu. Memories and lifetime happenings are best celebrated with the best! Make Buddha-Bar Manila your Valentine’s Day choice and celebrate the most romantic season of the year only at Buddha-Bar Manila! Just so you know, I have included Buddha Bar in my list of romantic places to go to.